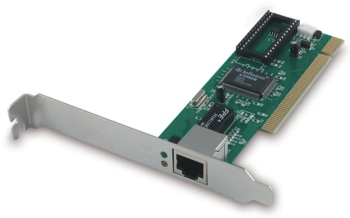 Any computer that is to be connected to a network, needs to have a network interface card (NIC). In a laptop, the wireless radio antenna is usually built in to the side of the screen, so you don't need to have a long bit of plastic sticking out the side of your computer! To connect together different devices to make up a network, you need cables. Cables are still used in most networks, rather than using only wireless, because they can carry much more data per second, and are moresecure (less open to hacking). 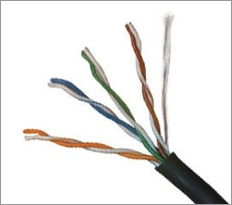 The most common type of network cable cable in use today looks like the one shown above, with plastic plugs on the ends that snap into sockets on the network devices. Inside the cable are several copper wires (some used for sending data in one direction, and some for the other direction). A hub is a device that connects a number of computers together to make a LAN. The typical use of a hub is at the centre of a star network (or as part of a hybrid network) - the hub has cables plugged into it from each computer. A hub is a ‘dumb’ device: if it receives a message, it sends it to every computer on the network. This means that hub-based networks are not very secure - everyone can listen in to communications. Hubs are pretty much obsolete now (you can't buy them any more), having been superseded by cheap switches. A switch, like a hub, is a device that connects a number of computers together to make a LAN. 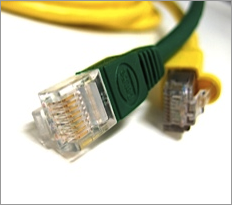 The typical use of a switch is at the centre of a star network (or as part of a hybrid network) - the switch has cables plugged into it from each computer. A switch is a more ‘intelligent’ device than a hub: if it receives a message, it checks who it is addressed to, and only sends it to that specific computer. Because of this, networks that use switches are more securethan those that use hubs, but also a little more expensive. A router is a network device that connects together two or more networks. A common use of a router is to join a home or business network (LAN) to the Internet (WAN). The router will typically have the Internet cable plugged into it, as well as a cable, or cables to computers on the LAN. 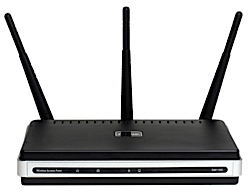 Routers are the devices that join together the various different networks that together make up theInternet. A proxy server is a computer setup toshare a resource, usually an Internet connection. Other computers can request a web page via the proxy server. The proxy server will then get the page using its Internet connection, and pass it back to the computer who asked for it. Proxy servers are often used instead of router since additional software can be easily installed on the computer such as anti-virus, web filtering etc. A bridge is a network device that typically links together two different parts of a LAN. 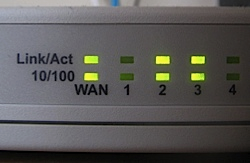 Whereas a router is usually used to link a LAN to a WAN (such as the Internet), a bridge links independent parts of a LAN so that they act as a single LAN. If you wish to protect your whole LAN from hackers out on the Internet, you would place a firewall between the LAN and the Internet connection. 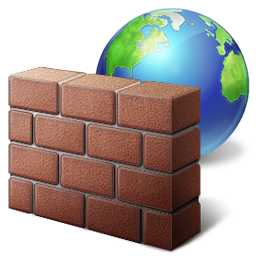 A firewall blocks unauthorised connections being made to your computer or LAN. Normal data is allowed through the firewall (e.g. e-mails or web pages) but all other data is blocked. 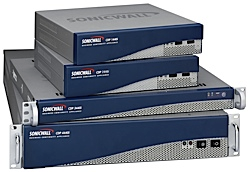 In addition to physical devices, firewalls can also be software. Before the days of broadband Internet connections, most computers connected to the Internet via telephone lines (dial-up connections). The problem with using telephone lines is that they are designed to carryvoices, which are analogue signals. They are not designed for digital data. 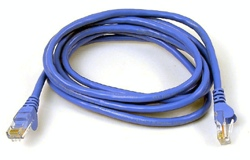 The solution was to use a special device to join the digital computer to the analogue telephone line. This device is known as a modem. A modem contains a DAC and an ADC. 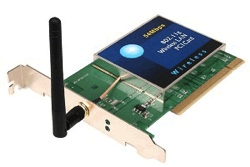 The ADC in the modem is required so that the analogue signals (noises) that arrive via the telephone line can be converted back into digital data. The reason telephone lines were used is that almost every building in the world is already joined to every other via the telephone system. Using the telephone system for connecting computers meant that people didn’t have to install new wires to their houses and offices just for computer use. In the last few years however, this is exactly what people have done. Special cables have been installed just for Internet access. These special cables are designed to carry digital data, so no modem is required. The word modem is an abbreviation of MOdulator DEModulator. A modulator acts as a DAC, and a demodulator acts as an ADC. If you have ever used a dial-up connection, you have probably heard the noises sent by the modem down the telephone line. They sound like a horrible screeching beeping sound.